DeCree, the Prime Minister, is writing a dictionary for the King, but there has been some disagreement over the definition of delicious. The Prime Minister believes that "delicious is fried fish," but the King believes it should be an apple, while the Queen says pudding and the General says beer. Deciding that this matter cannot be decided without input from the rest of the kingdom, DeCree sends Vaungaylen (known as Gaylen), his twelve-year-old adopted son, to ride his horse to the four towns and take a poll. As Gaylen embarks upon his journey, however, Hemlock, the queen's brother, also rides out on a sinister errand - that of discrediting the king and inciting civil war so that he might claim the throne for himself. As Gaylen polls each town, dangers mount as Hemlock gets closer and closer to victory, and it is only the magical beings no one believes in anymore who have any hope of saving the day. 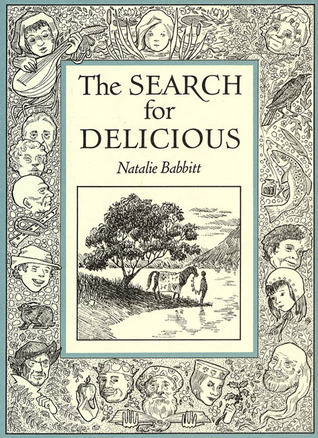 I have had a long-standing aversion to the books of Natalie Babbitt because I hated reading Tuck Everlasting when I was in sixth grade. (I was deeply troubled by the idea of someone who never got old. It still gives me the creeps, knowing that everyone the Tucks loved would eventually die and leave them. Ugh.) This book, which was published several years earlier, has a much more lighthearted tone and focus, so I wasn't troubled by it in that sense, but I have mixed feelings, mainly about the story's overall message. It is very clear throughout this book that Babbitt is trying to comment upon the foolishness of war. She shows how a simple disagreement over a dictionary definition spirals quickly out of control and becomes a matter of life and death. Unfortunately, her attempts to simplify the concept of war for her young audience have resulted in a story which trivializes the perils of battle and paints an idealized portrait of the world where all wars can be prevented if we stop arguing over silly things. It's not necessarily a bad idea to use an allegory to help kids understand a complicated fact of life, but this story didn't ring true enough to make it work. Instead, it reduces war to something light and laughable. The supernatural elements of the story were also used in a way that felt inauthentic and forced. Gaylen, who is set up to be the hero of the story, and even has to give himself a pep talk at one point in order to pursue what he knows to be the right path, ends up being heavily overshadowed by the woldweller, the dwarves, and the mermaid whom he encounters on his journey. Gaylen seems to have the fortitude as a character to take on the evil Hemlock if given the chance; it's odd, therefore, that Babbitt ultimately allows the magical characters to be the ones who save the kingdom. The Search for Delicious starts out seemingly strong, but ends up being pretty disappointing. I liked the tone early on in the book, and there were some clever moments of fun wordplay, but these just didn't match the story Babbitt was trying to tell. There is just no need to read this book when you can happily read Tolkien instead.